British-born maestro Edward Gardner spurred the Seattle Symphony, SSO Chorale, and three particularly fine soloists forward in a performance of Edward Elgar’s “The Dream of Gerontius” that never lost focus or momentum. The term “neglected masterpiece” has long hovered around Edward Elgar’s mighty “The Dream of Gerontius,” last heard in Seattle in 1991. 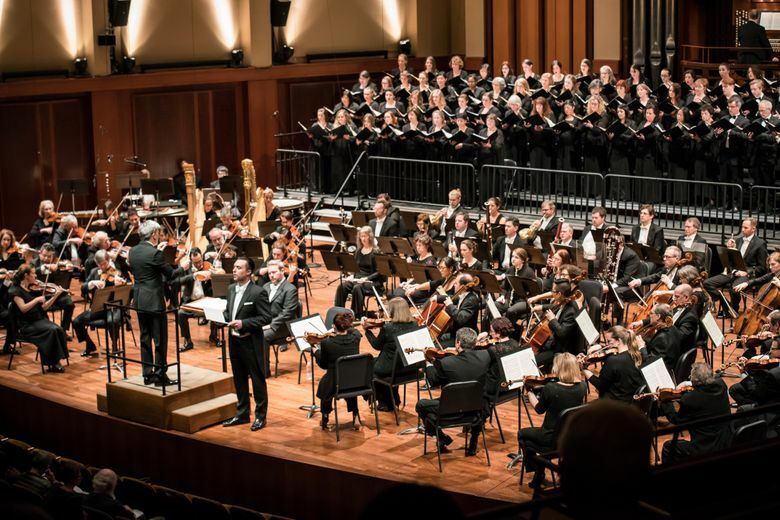 In the hands of a conductor and performers who believe in this powerful oratorio, however, “Gerontius” can shiver the timbers of concert hall and audience alike – as it did in the first of two Seattle Symphony performances on Thursday evening. Edward Gardner’s powerful, impassioned conducting illuminated the life-and-death struggles of the score that Elgar called “the best of me.” From the opening phrases to the transcendent finale, the British-born maestro spurred the orchestra, chorale, and three particularly fine soloists forward in a performance that never lost focus or momentum. At particularly dramatic moments, Gardner practically levitated off the podium, sometimes gripping his baton with both hands and flailing it as if wielding a weapon. And there were plenty of dramatic moments, too, with the full orchestra and the Watjen concert organ (admirably played by Joseph Adam), and the Seattle Symphony Chorale in full voice (well schooled by Joseph Crnko), representing both ethereal angels and surprisingly feisty demons. with Edward Gardner conducting; repeats 8 p.m. Saturday at Benaroya Hall, Seattle; $22-$122 (206-215-4747 or seattlesymphony.org). Crucial to the production’s success were three soloists who could hardly have been better. The greatest challenges fell to tenor Robert Murray, who sang Gerontius with beautiful timbre, expressive depth, and immaculate diction. Baritone David Soar was powerfully impressive as the Priest and the Angel of the Agony. Mezzo-soprano Sasha Cooke, most recently heard as Hansel in Seattle Opera’s “Hansel and Gretel,” was an angelic Angel indeed — producing a warm, rich tone quality, evenly throughout her register. The music, set to a text by Cardinal John Henry Newman, flows through a series of scenes indicating the soul’s journey, sometimes in quiet reflection, in tremulous fear, and in the certainty of salvation. Elgar is a clever colorist who knows how to pair his mezzo-soprano with the warm-toned accompaniment of cellos and violas, instruments that mimic and support the voice particularly well. Combining soloists and chorus with the power of the pipe organ, not to mention a full symphony, may well be the best possible audio representation of the glories of heaven. One aspect of the presentation didn’t seem to have been considered in advance: the awkward pause between the two parts of “Gerontius.” There was no intermission; both halves of the 95-minute work were performed with only a short break in between. At the break, the audience was clearly wondering: Should we applaud? (A few did, sounding a bit tentative.) Most oratorio performances do involve an intermission; it mightn’t have been a bad idea here. At the premiere of “Dream of Gerontius,” back in 1900, the woefully underrehearsed performance had been so bad that Elgar entertained serious thoughts of suicide. Would that he had been in the house for Thursday’s Seattle performance! Elgar’s masterpiece is still too often overlooked, but when given such a skilled and committed reading, “Gerontius” can shine again.